The plane-boat started its improbable journey as a Boeing 307 Stratoliner originally owned by industrialist and aviation pioneer Howard Hughes who acquired the plane in 1939 as part of his purchase of TWA. The 307 was the worlds first commercial pressurized aircraft that was a variant of the B-17 Flying Fortress. Only ten were built in the late 1930s as production was discontinued by government order at the outbreak of World War II in September 1939. (One 307 has survived fully intact and has undergone a complete restoration by Boeing in Seattle for its owner, the National Air & Space Museum). In 1938, Hughes shattered the around-the-world flight record in a twin-engined Lockheed 14 for which he received a tumultuous heros recognition. In an apparent effort to beat his own record he prepared the 307 with extra fuel tanks, but was forced to cancel the attempt with war in Europe. After denying use of the plane to the military, in 1948 Hughes had a new interior built by industrial design pioneer Raymond Loewy, with decor suggestions from Rita Hayworth to become one of the first conversions of a commercial airliner into a plush executive transport. 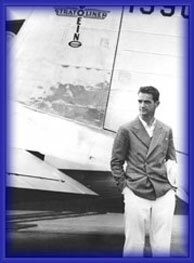 Howard Robard Hughes Jr. (19051976) once held every aviation speed record of consequence. He owned TWA, two regional airlines, Hughes Aircraft, RKO studio, mining properties, Hughes Tool Company, casinos and hotels, a medical research institute, and a vast amount of real estate. By the time he died, he was a mentally ill recluse. 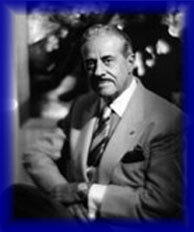 Raymond Loewy (18931986) designed many of the corporate logos and objects that became defining images of the period between the 1930s and the early 1960s, like the Lucky Strike cigarette package, the rounded Coke bottle, the Pennsylvania Railroad GG1 electric locomotive, and the classic United UPA 100 jukebox from 1957. Born in France, he translated a distinctly European sense of style into dozens of American industrial objects and gave household appliances an almost unprecedented visual command within a space. Loewy also realized that image is one of the most important facets in moving product and he paid great attention to both his personal appearance and that of his company. The Model 307 Stratoliner was the worlds first high-altitude commercial transport and the first four-engine airliner in scheduled domestic service. With names like Rainbow, Comet, Flying Cloud, and Apache, the Stratoliner set new standards for speed and comfort. Its pressurized cabin allowed the airplane to soar above rough weather at an altitude of 20,000 feet  higher than any other transport of its time. Its circular fuselage provided maximum space for the five crew members and 33 passengers. The nearly 12-foot-wide cabin had space for comfortable berths for overnight travelers. The Stratoliner was the first airplane to have a flight engineer as a member of the crew. The engineer was responsible for maintaining power settings, pressurization and other subsystems, leaving the pilot free to concentrate on other aspects of flying the aircraft. Boeing built 10 Stratoliners. In 1940, the 307s started flying routes to Latin America and from New York to Los Angeles. Production stopped at the onset of war, and five were drafted into the Army Transport Command as C-75 military transports.